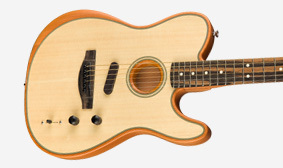 The American Acoustasonic™ Telecaster® embodies the spirit of purposeful innovation that Fender was built on. From acoustic shape-shifting to electric rhythm tones, this powerful guitar uses a revolutionary Fender and Fishman®-designed Acoustic Engine to deliver new sonic expression from the studio to the stage. The hollow Telecaster-inspired body is naturally loud and resonant with plenty of projection, meaning the guitar sounds as great on your lap as it does live on stage. 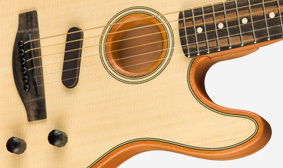 The Fender and Fishman-designed Acoustic Engine powers the Acoustasonic Telecaster and delivers a curated collection of acoustic and electric voices. 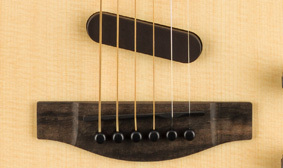 Designed for authentic hum-free Fender electric tone, this pickup can be played solo or blended with an acoustic voice to create new sounds. 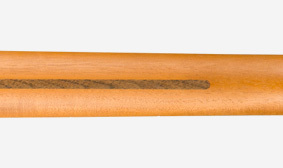 The mahogany Telecaster neck with ebony fingerboard offers a familiar playing feel and adds warmth to the guitar’s tone. 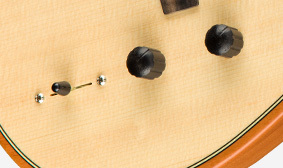 The patent-pending Stringed Instrument Resonance System (SIRS), inlaid top and modern electronics were created expressly for this instrument. 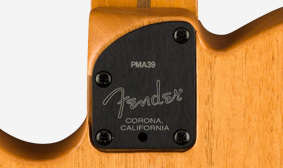 This state-of-the-art guitar is crafted in Corona, CA, at the same factory as our iconic electric instruments. Neck Shape: Modern "Deep C"
Entregas em 24h para o continente. Gratuitas a partir de €99.